Corpus Christi Marina officials got to take a closer look Friday at an expandable vessel they hope will fill a lot of duties around the marina. It's a multi-purpose emergency response vessel or "MERV, for short. Its creators brought the vessel all the way from Louisiana to demonstrate some of the functionality of the vessel. Marina officials are considering purchasing the $700,000 vessel as part of an effort to beautify and enhance the marina. 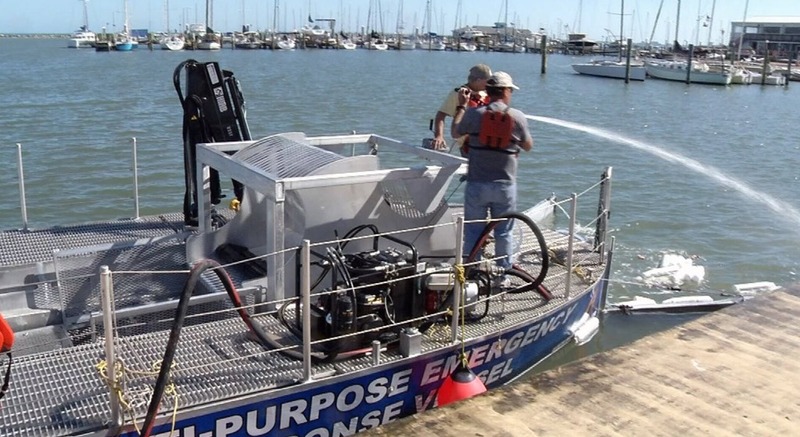 The vessel is able to pick up trash as well as clear oil spills and fish kills. "It has 27 different modules, so it'll never be idle," said marina superintendent Peter Davidson. "The fire department, police dive team, our marina patrol will all utilize this, 24 hours a day 7 days a week." Some of the modules include fighting fires, shooting foam up to 75 feet, and being used as a dive base for search and rescues. It also has a crane on board that allows it to pick up heavy objects, like an overturned vehicle in an accident.